Our policy is straightforward, non-negotiable, and all-inclusive. In our sector, it needs to be. It's also the bedrock of our industry-leading positioning, as it is of our winning, and being a finalist in, prominent New Zealand Health & Safety Awards. This Health and Safety Policy applies to McLeod Cranes Ltd and McLeod Hiabs Ltd.
McLeod is committed to working in partnership with our customers to ensure the protection of employees, property, environment and other people, including the general public, from accidental injury or damage by the work we perform. There is health, safety, quality and environmental considerations in all aspects of our business. Our management team, in consultation with staff, will establish a safe working environment, will work to identify and manage foreseeable hazards, and enforce safe working practices. Our employees, the environment, property and all people, including the general public are protected from accidental injury or damage by the work we perform. We provide and maintain a safe and healthy working environment, safe systems and methods of work. We clearly define everyone’s responsibility for health, safety, and environmental matters. All activities are carried out safely and without causing harm to fellow workers, contractors, customers and the general public. 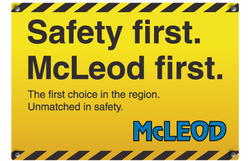 We encourage McLeod employees to participate and provide feedback on all health and safety matters. We provide all employees with information, training, and supervision that they need to work safely and efficiently to develop safety awareness among our team. We accurately report, record and investigate workplace accidents, incidents, and notifiable events. All employees are encouraged to participate in accident investigation. We support the safe and early return to work of injured employees. This policy is communicated to all team members, and we make it freely available elsewhere. All McLeod employees are responsible for implementing this policy. In addition, we're committed to ensuring all employees have a clear understanding of Health & Safety issues specific to their roles. It's worth repeating. At McLeod, we continuously strive for operational improvement in every aspect and detail of our business. When it comes to Health & Safety, we accept nothing less than excellence. This policy is reviewed annually, and employees are made aware of any changes.